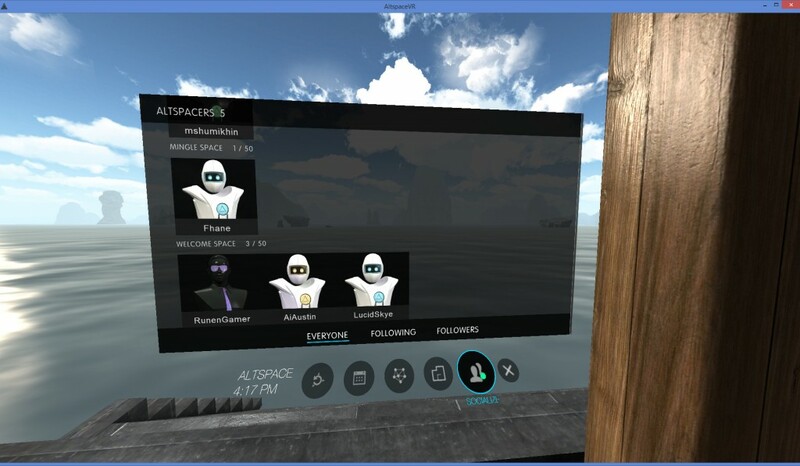 AltspaceVR (http://altvr.com) is developing a virtual world in which people can meet, chat, share media and have fun. Interested users could register for the beta-testing events and they were invited into a beta-test weekend on 25th and 26th April 2015. 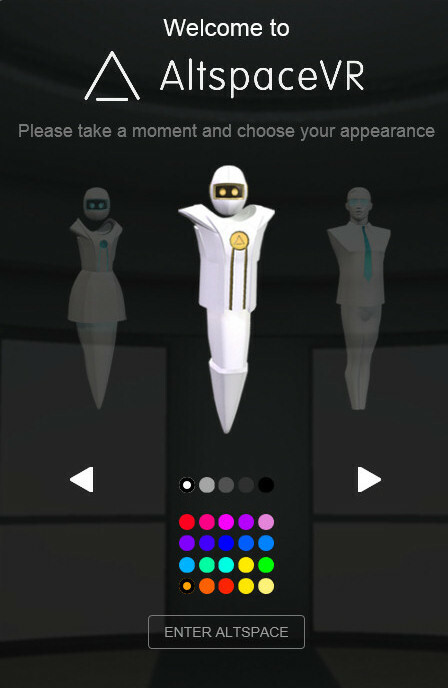 Avatar choice is quite simple, a male, female and neutral robot style avatar which can have a custom coloured badge. 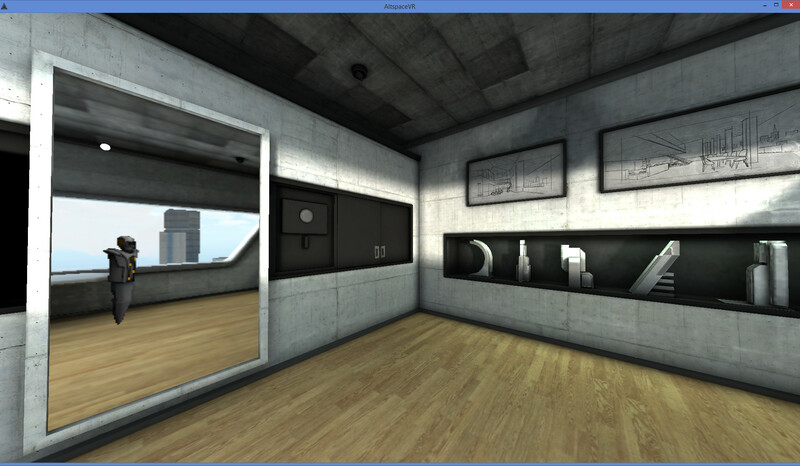 For 2D use, toggle between using the mouse to look round and mouse to select things using Alt+left click. You need this to select menu items, and focus the mouse to make selections or click things. Alt+Enter lets you switch between Windows applications, e.g. 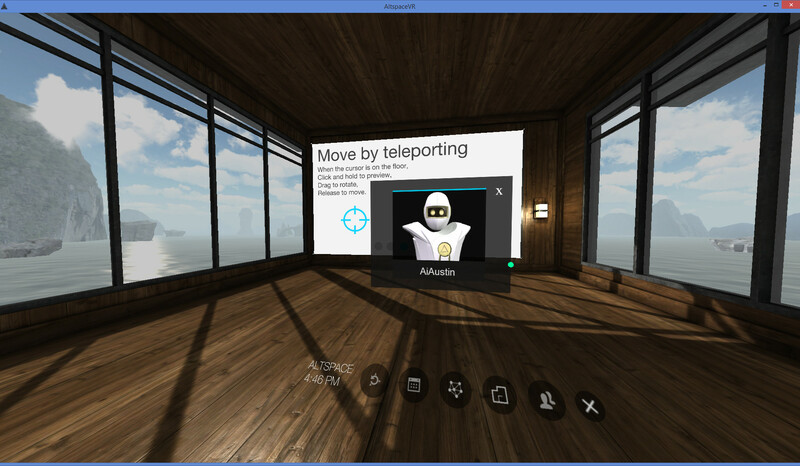 to toggle between AltspaceVR and another Windows tool to capture images. Esc brings up a dialogue to let you exit the app. 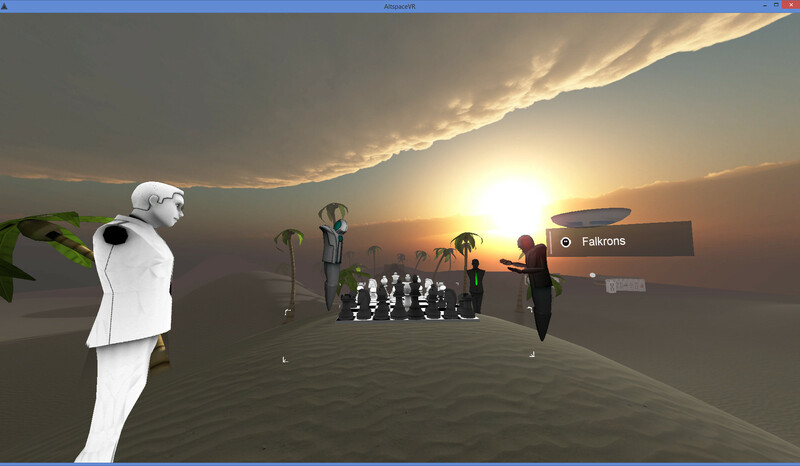 A very helpful beta-tester and developer based in the Eastern USA called “Falkrons” gave me some tips and showed me some demos on a “Place” called “Desert Island”. 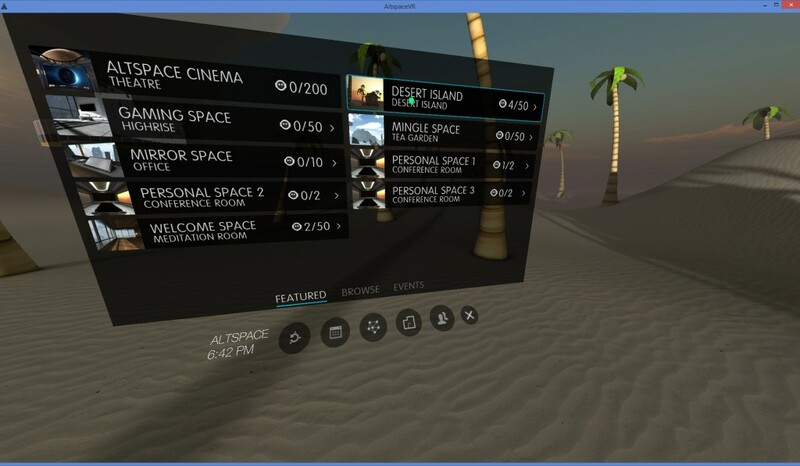 The main menu is brought up with a right click of the mouse and lets you access the web media browse, events list, and spaces list including showing how many users are in each space and the space capacity (N/M). A socialize button lets you see who is in each space and go to them, or “follow” them which adds those you meet, friends or colleagues to your followers list and allow you to see if they are online. As this was over a weekend, I could not conveniently use my Oculus Rift and Leap Motion equipped system which is in a work location. So my testing was limited to 2D view and mouse interaction. I plugged in an Xbox for Windows controller, but only the left stick seemed to work to change my viewpoint. The right stick did not move the avatar. 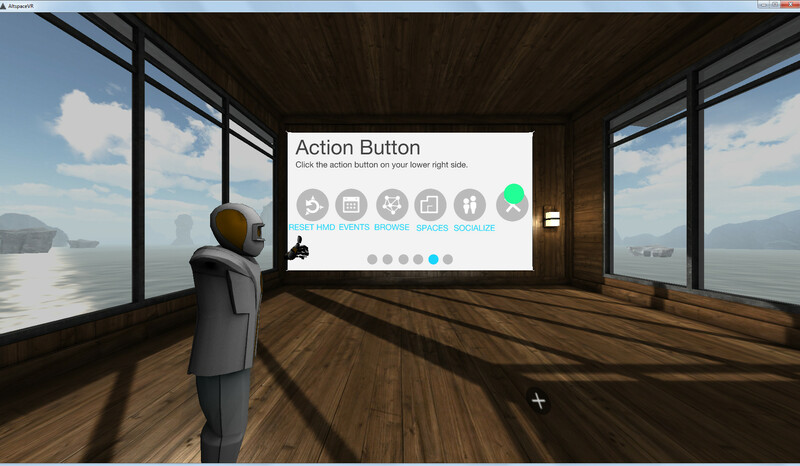 That might be a configuration issue, as the controller is used in things like the Second Life viewers. Voice worked very well indeed, and was 3D spatially situated. I could not see text chat anywhere, and AltspaceVR confirmed it is not (yet) included. That would be useful for when voice is inconvenient, and for sharing information via copy and paste and for web links. Mouse focus and use was very awkward… and moving between using the mouse to move the camera and having it available for interaction with screen icons via alt+left click was awkward. 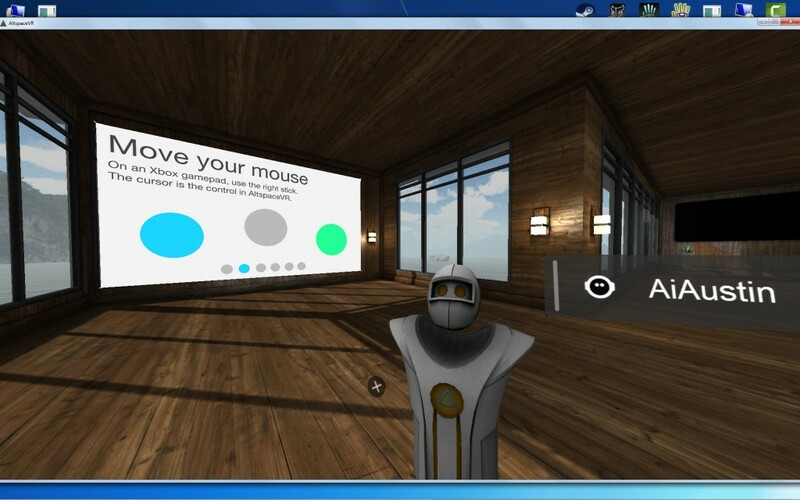 Moving the mouse outside the AltspaceVR window did not give me control back, I had to use the windows alt+tab to switch apps to get back to the Windows desktop. 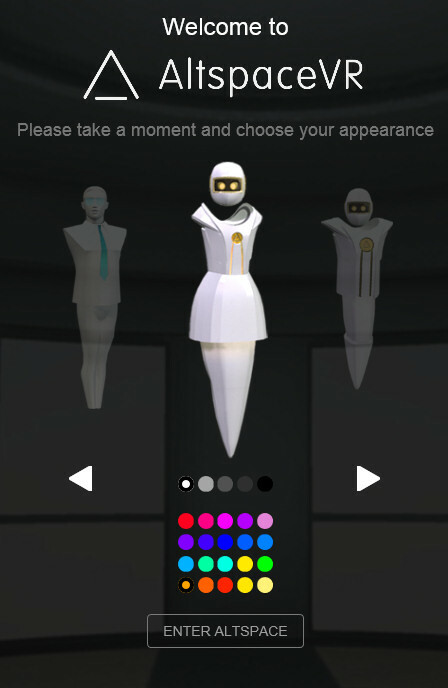 Feedback that your own voice was active by flashing the “X” icon for the AltspaceVR interaction menu was odd. I only knew that was what was flashing as a more experience user told me. An icon that looked more like a loudspeaker flashing would be more intuitive. 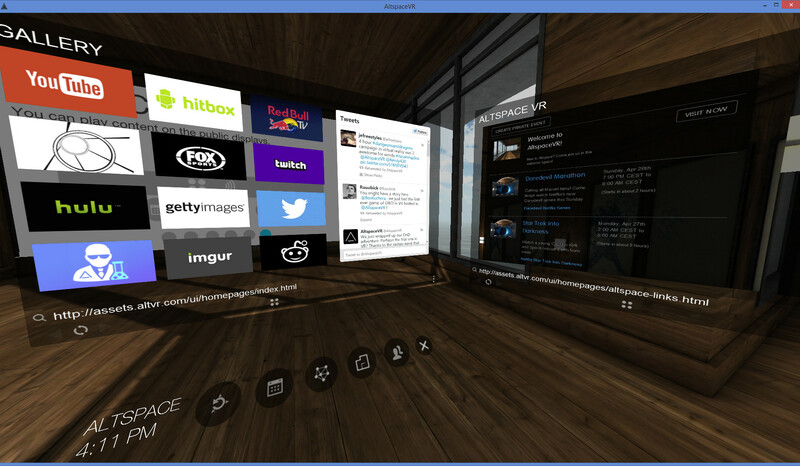 Following on from the beta test weekend, I tried access via the Oculus Rift DK2 working in direct mode. 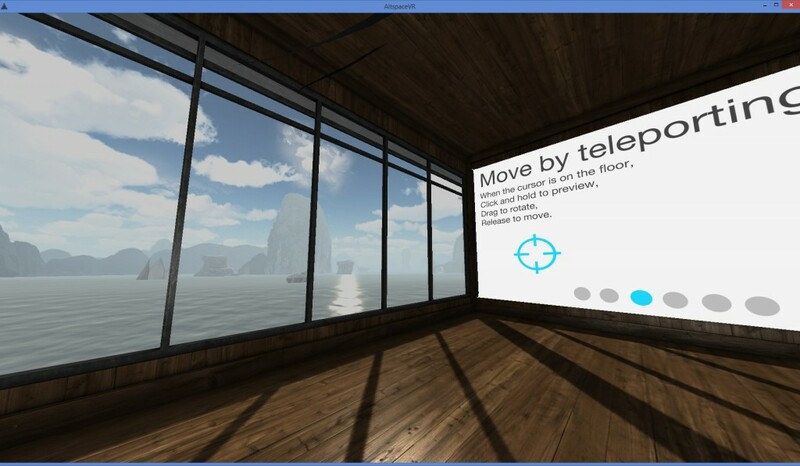 The 3D imagery is very crisp and menu buttons and popup panels, avatar name tags, etc are all displayed at a comfortable eye distance. I could not work out how to take a screen snapshot of the Rift “double barrel” view… but here is a shot of how the Rift equipped avatar, Ai Austin, appears when seen by another avatar. The head moves up, down and right or left depending on where your gaze is in the Rift. The Leap Motion device is also supported… but it is assumed the device is mounted looking forwards and downwards on the Rift HMD.. Mine is flat on the table looking up and back to the user, so left and right hands are flipped/mirrored. 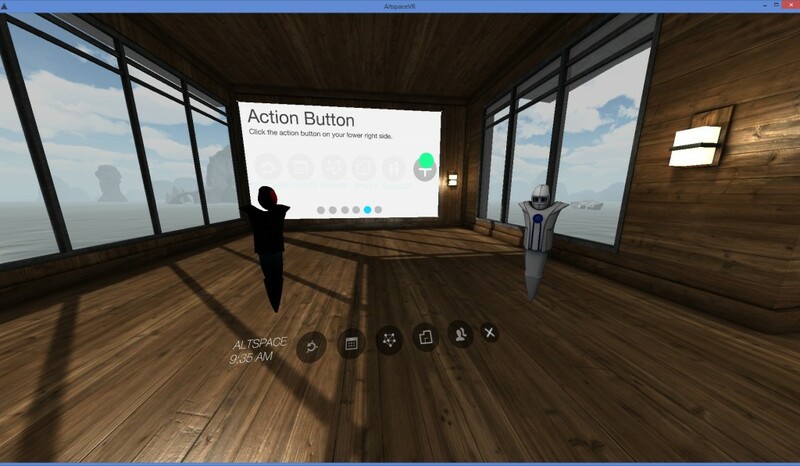 The Leap Motion is automatically discovered by AltspaceVR and a hand or hands in its field of view show in world for the avatar. Arms are not shown for the Leap Motion, though images from other users indicate that arms are shown if a Microsoft Kinect is used for hand input. 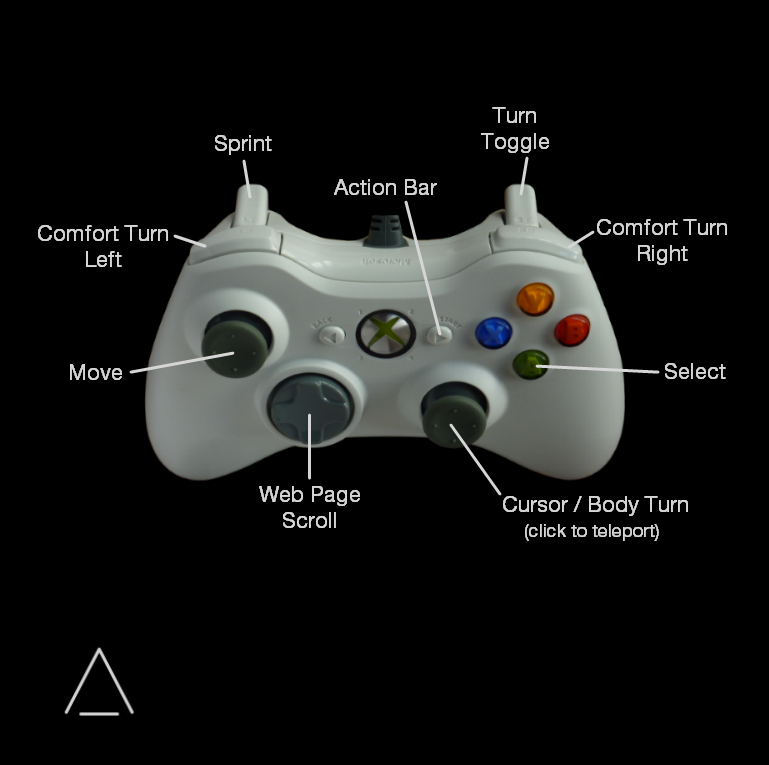 When using the Xbox 360 for Windows controller, the left stick controls avatar forward, back, strafe left and strafe right with turns done via the direction you are looking in the Rift. The right stick moves the cursor focal point so you can operate menus – which can be done with the “A” select button on the controller. left and right bumpers rotate the avatar. 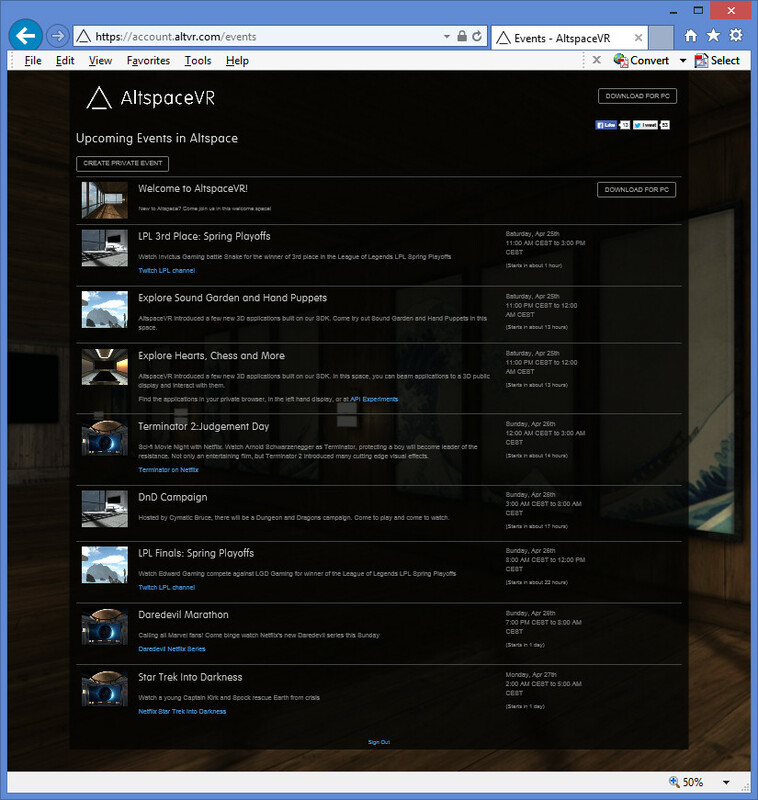 More details are on the AltspaceVR help pages (see notes). 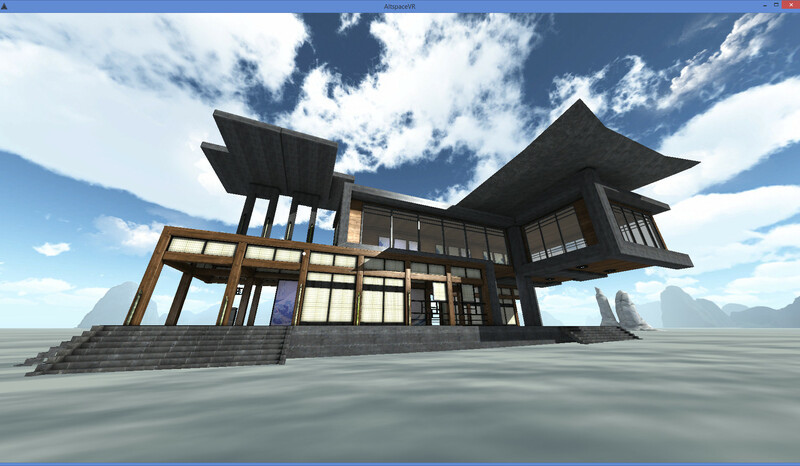 This entry was posted in Virtual World, VR and tagged AltspaceVR, Virtual World, VR. Bookmark the permalink.